Located in the Arctic Watershed part of the world famous Albany River system NW of Nakina Ontario lies Meta Lake. A pristine glacial cut Canadian shield lake, Meta is uncharacteristically shallow compared to the surrounding waters and ices out earlier than nearby and adjoining lakes In the spring. This warmer water draws Walleyes and Northern Pike from the entire system "en masse" to feed and spawn, creating an incredible late spring and summer fishery. From opening day, Meta Lake offers exceptional Walleye , Perch and Northern Pike fishing. Live bait rigs, jigs tipped with minnows, spoons, crank baits and spinners all produce some of the finest fishing action found anywhere in the world. Early Walleyes disperse to points, shoals and the mid-lake island cluster. 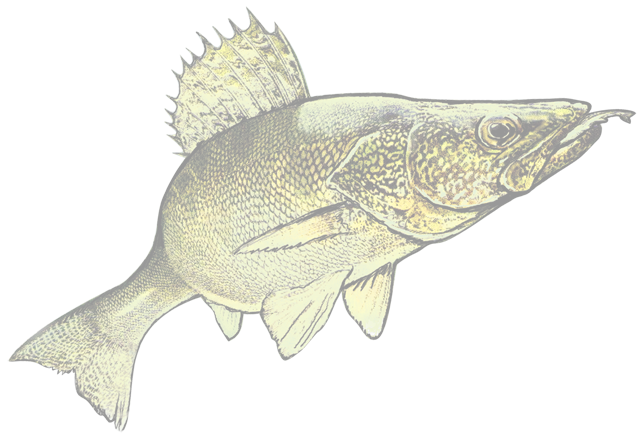 As summer develops and the water warms, Walleyes and Perch also move into the lake's weedy sections and hold along weed lines. Windy weather at Meta Lake really turns the Walleye bite on! Around the mid-lake island cluster and its massive rocky shoal outcroppings you will enjoy exceptional fishing, tossing twistertail jigs to feeding Walleyes - as shallow as four feet in the "surf". Losing a few jigs to the rock piles is inevitable, but makes quick limits all worthwhile. Expansive weed beds in back bays and defined submerged weed lines in the main lake attract and hold large schools of fish throughout the summer, especially the lake's numerous trophy Northern Pike. Casting or trolling spoons, spinner baits, top water plugs or crank baits produce constant Pike and Walleye action through out the entire season. Some of the very best action for trophy Northern Pike is experienced throughout July and August with big fish relating to fully developed weed beds and fast-breaking points and rock piles. Easily accessible from Meta Lake is Ara Lake, an exceptional quality summer Walleye, Perch and trophy Northern Pike fishery in its own right. A classic rocky shield lake, Ara Lake is a mecca for jig fishermen and those who prefer to troll. All packages include one of our beautiful 18' cedar strip wooden boats per 2 or 3 guests outfitted with electric start 15hp 4-stroke motors, high back swivel seats and seat cushions, landing net, anchor, live bait bucket safety kit and paddle. There is also a 12v battery for any personal electronics. Fish finders are available for guests who don't have their own portable unit. Once you've spent a day fishing in one of these gems you will truly appreciate their soft ride, abundant space and superior stability in any conditions. A well maintained camp, Meta Lake Lodge offers guests clean, fully equipped modern comfortable log cabins. Complete with living room, kitchens, 24 hr generated electricity, electric refrigerator and propane stove. The bathrooms have hot shower, sink and flush toilets. The two large bedrooms are capable of sleeping 6-8 people. A wood stove provides cozy heat for evening filled with storytelling, card playing and R&R. Split wood is provided at one of the many wood depots located around the camp. The main lodge includes a cozy dining hall that serves up incredible meals (American Plan) complimentary welcome breakfast and Wednesday night fish fry. There is also a supply of tackle along with bagged ice, snacks and souvenirs. A satellite TV for special events, news, and local weather as well as satellite wireless internet and Skype phone are available for those who wish to keep in touch with home and business.